So you want to be a storm chaser? 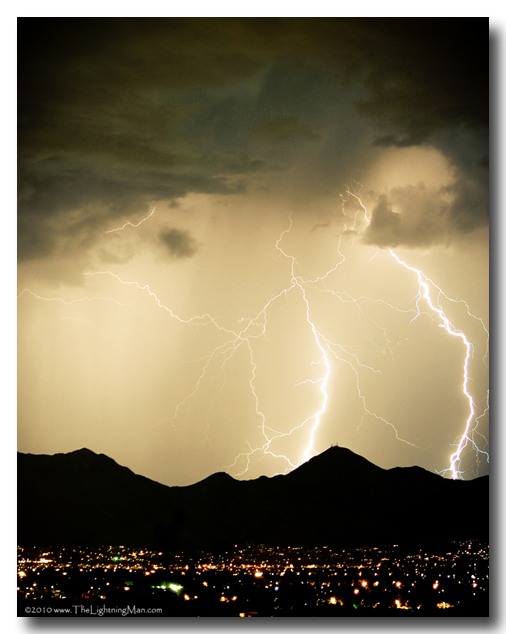 Most people think to photograph lightning you have to be quick! But it ‘s really the opposite. You have to be slow. Let me explain… you have to shoot slow. Time exposures. If you have a point and shoot make sure you have a tripod and the best is to start with a 15 sec exposure. Depending on your surroundings, lighting, city lights and so on, your F stop should be about f8- f11. ISO 100 always use a good sturdy tripod. Wind is the enemy. Also a good thing to have in your bag is a cheap shower cap. You can use this to put over your camera to protect from the rain. Patience is the key. So many of my friends have asked to go with me, most fall asleep. But when it is exciting and hitting good it is a rush like you have never felt. I think part of it is knowing that you can get zapped at anytime. When I did the Budweiser brewery storm chase during the first part of the chase I was afraid to get out of the SUV. And when I did start shooting I would set my shutter and then jump in the back of the SUV with my feet off the ground and the somewhat protection of four rubber tires. So watch the storm. Scan the horizon, see where the strikes are hitting. They will keep hitting in the same area. The key is to time them in your mind to see if you have a winner. You want lightning bolt strikes to hit twice with-in a minute. If they hit once every 1/2 hour it is very difficult to catch on camera. Once you find that it is hitting in the same area multiple times, find a good composition. I am not one for power lines and houses. But if that is all you got well the thrill is on. Open your shutter and wait for the strikes. If you have an SLR or DSLR you can use the bulb mode and simply open your shutter wait for the strikes and then release. Or you can set it to 15 sec or 30 sec and keep shooting until you get something. Again your f stop should be around f8 to f11. for starters and adjust from there. There are variables. If the lightning is striking close and is very bright then you will want to be higher and closer to f16. if it is far away start at 8. You may have to open more to f5.6. But for beginners I would set up on a tripod. Find an interesting spot/view. Set your camera to 15 sec f8 and go from there. ISO 100. I am assuming most will be shooting digital. If that is the case you can look and adjust. Again it depends on city lights or pitch black. So adjust with the conditions. Now if you are trying to shoot during the day you are going to have to be quick, it can be done but your chances just got less of getting something. You can do a rapid fire and hope you get something. Or a lightning trigger can work. I have never used one but they do work. I prefer to shoot smaller exposures and then layer the images together to keep the noise down in the image. So let say you shot 3 15 sec exposure in a row and got bolts in all three images. If you layer the three together it would be like doing a 45 sec exposure. Again this keep the image clean. And always safety is number one. If you smell an odor, they say the ozone and all the hairs on your body start to stand up… a charge is building and it is time to find a safe zone like your car. Trust me I have crawled out of a few situations. Wear athletic rubber type shoes. Stay away from leather soles. A pair of Croc shoes just saved a guy life recently. Do not become the high point on the landscape. AND Do not take risk. This is a very simple explanation. I ‘m not much of a writer but if you have any questions feel free to email me. 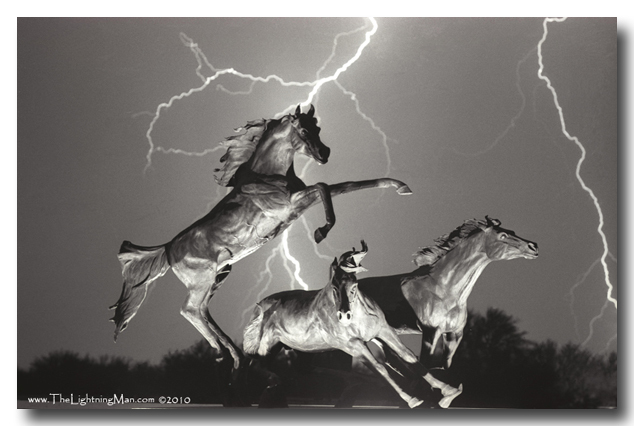 And thank you so much for visiting the lightning man web site.